If you are looking for a super delicious and very-easy-to-make summer dessert you have landed on the right page. 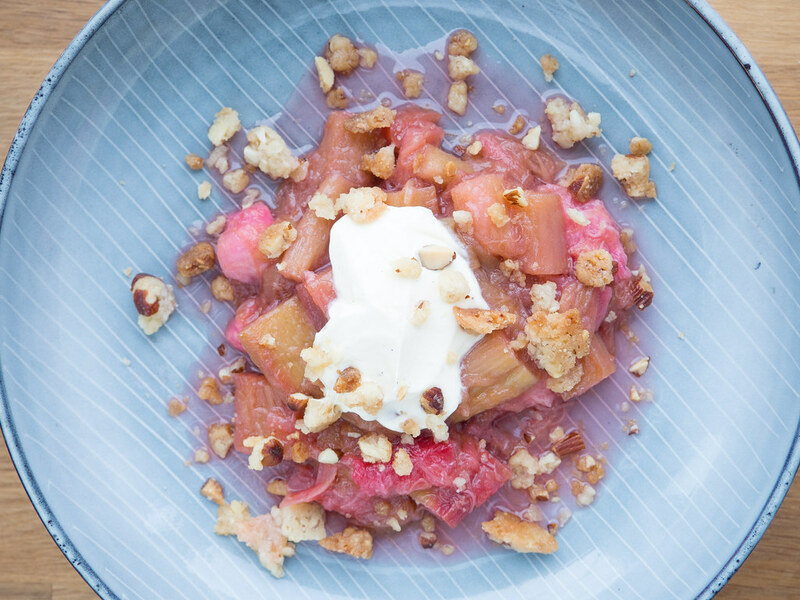 This time I would like to share on of my personal favorite desserts, homemade Roasted Rhubarb with Almond Crumble. I think it is the combination between the sour taste from the rhubarb and the sweet taste from the sugar that makes this dish to fantastic. In Denmark, rhubarb is ready to be harvest in the late spring and the start of the summer. I guess fact this is similar to other countries around the world. I do grow my own rhubarb in my garden so I have a personal supply of this great fruit (yes, it is actually typically considered as a fruit). However, you can easy find some fresh rhubarb in your local grocery store when they are in season. I normally serve this roasted rhubarb together with some homemade almond crumble and a whipped sour cream. I personally think this is the absolute best combination – super simple, elegant and very tasteful. The step-by-step guide how to make this dessert is very easy. You start by cleaning the rhubarb by cutting and washing away any dirt from the rhubarb. Remember that the thick and red end of the rhubarb contains the most and best taste – try avoiding removing too much here. 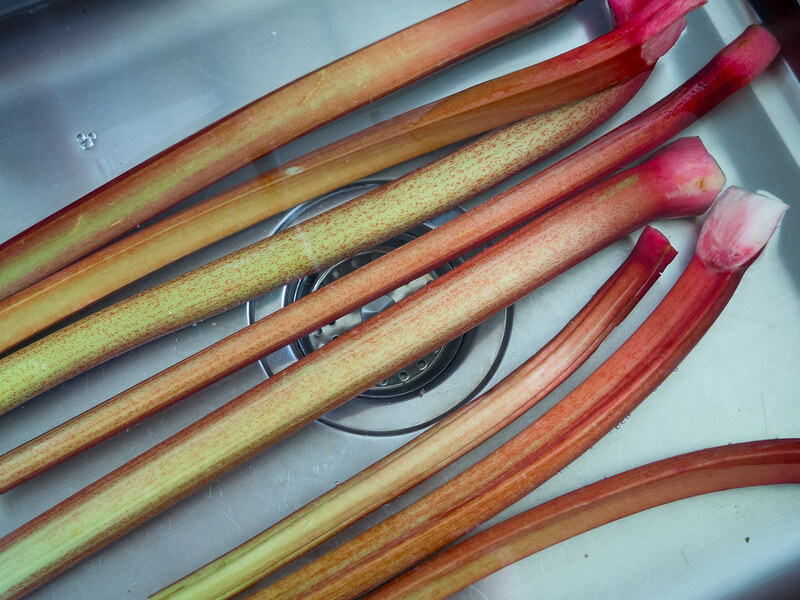 Now, cut the rhubarb into smaller pieces with a length of about 2 cm (1 inch). 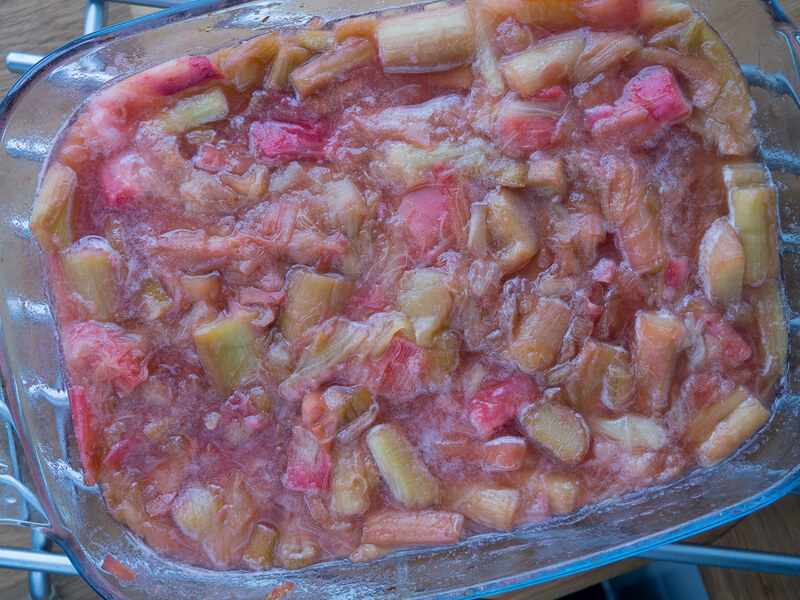 In an oven proof pan add the prepared rhubarb and mix it with the sugar. Roast the rhubarb in the oven for about 15-25 minutes at 160 C (320 F). The cooking time is depended on the sizes of the rhubarb pieces. Simple just roast the rhubarb until they have your preferred tenderness. 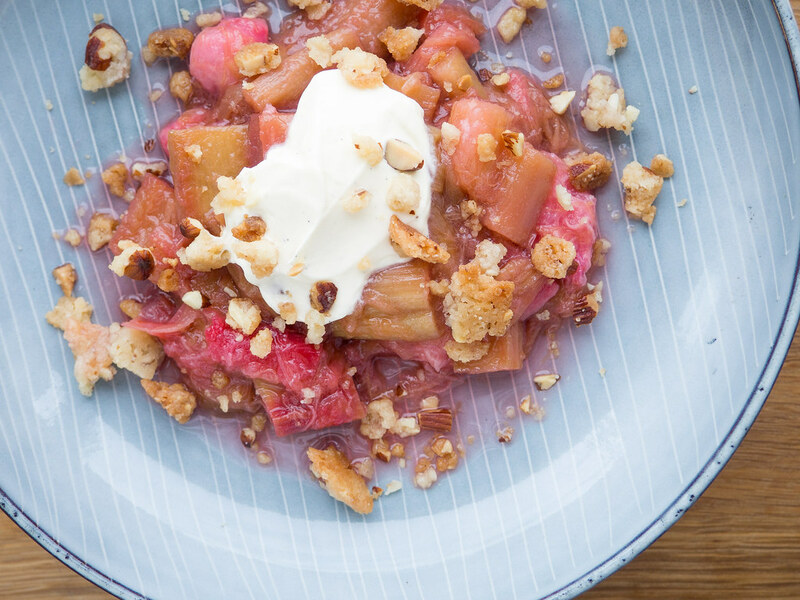 While the rhubarb is cooking; in a bowl add all the ingredients for the almond crumble. Use your fingers to assemble everything into a nice crumble. 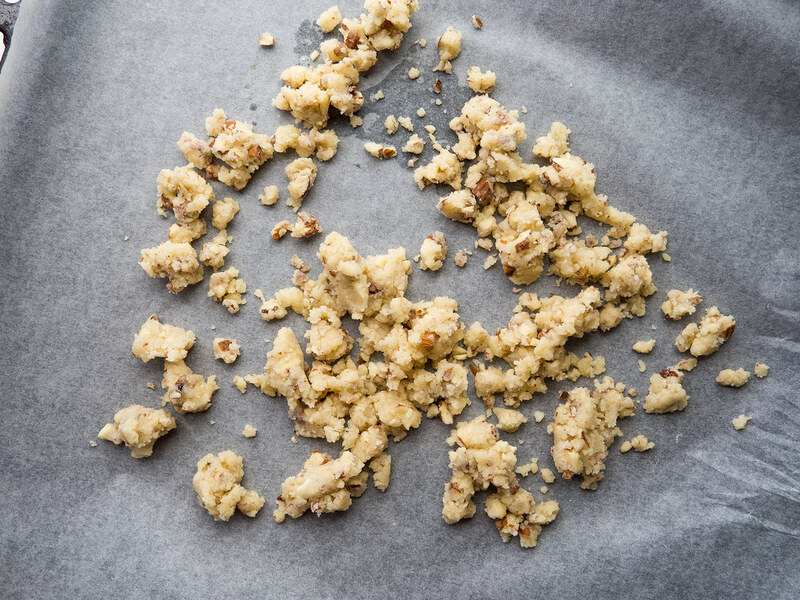 Transfer the crumble dough to a oven pan lined with parchment paper. Bake the crumble in the oven for about 6 minutes at 180 C (360 F). The rhubarb is done when the rhubarb pieces are tender and the sauce has your preferred consistency. Let it cool off before you serve it with some whipped 38% sour cream and the almond crumble. 1. Start by rinsing and cleaning the fresh rhubarb. Make sure all dirt is washed away. 2. 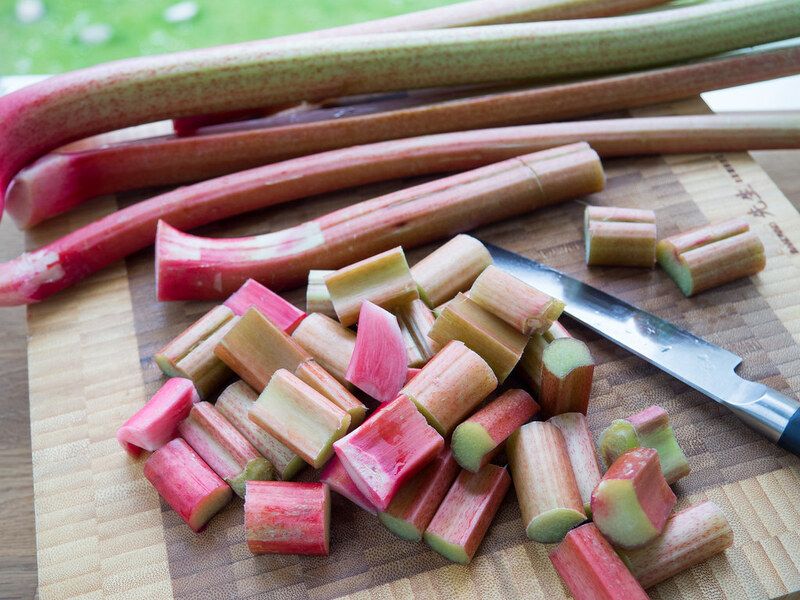 Cut the rhubarb into smaller pieces with a length of about 2-3 cm (1 inch). 3. 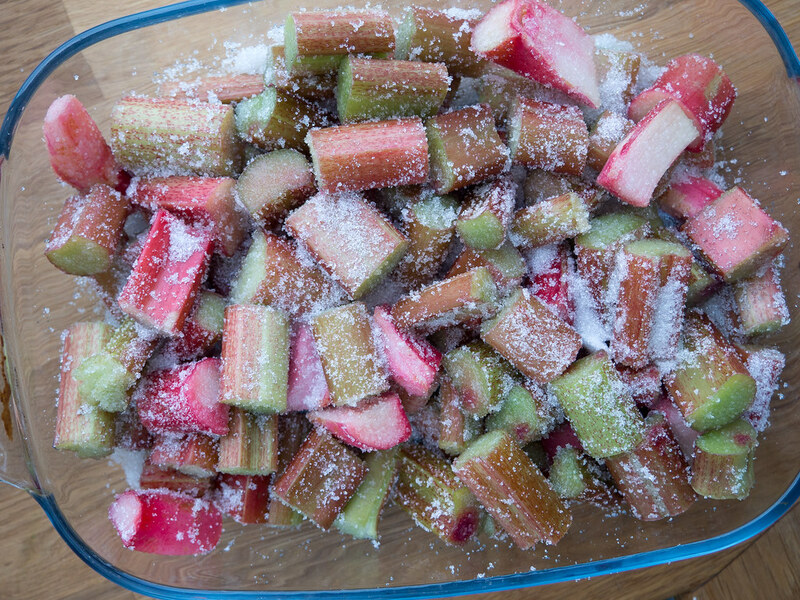 Transfer the rhubarb to an ovenproof dish and add the sugar. Mix the rhubarb and sugar a little. 4. Roast the rhubarb in a 160 C (320 F) hot oven for about 15-25 minutes depending on how tender your prefer the rhubarb pieces. 5. Let the roasted rhubarb cool off a little bit while you continue with the next steps. 6. 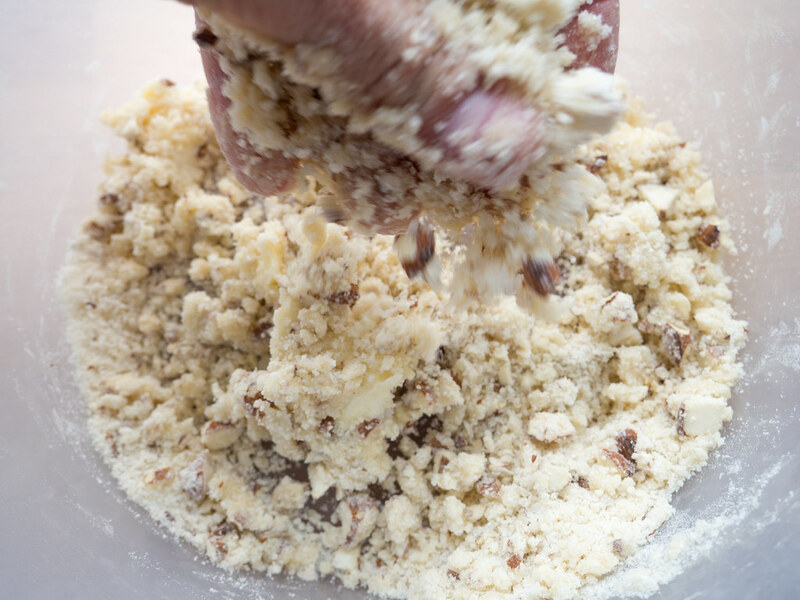 In a bowl, mix the cold butter, sugar, all-purpose flour, salt and the coarsely chopped almonds. 7. 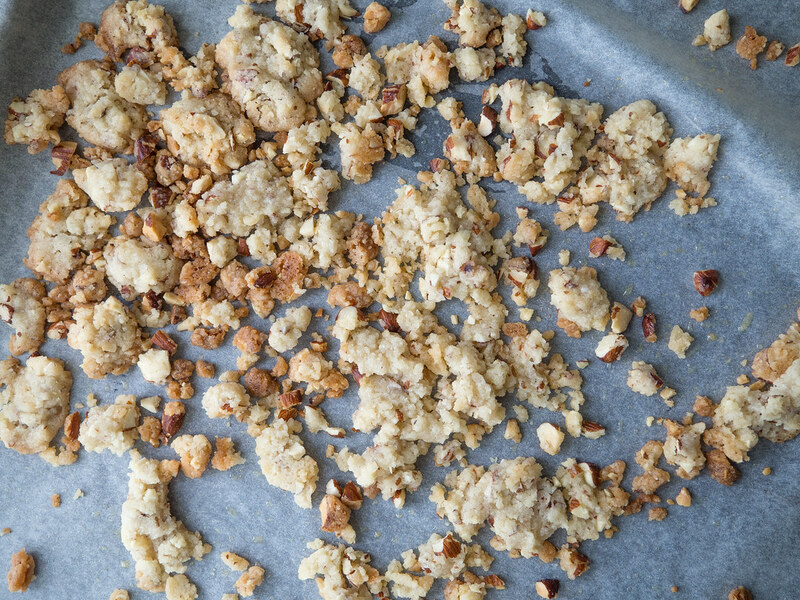 Transfer the crumble dough to an oven plate lined with parchment paper. The crumble should be in an even layer. 8. In a 180 C (360 F) hot oven, bake the crumble for about 6-7 minutes. The crumble should be golden in color. 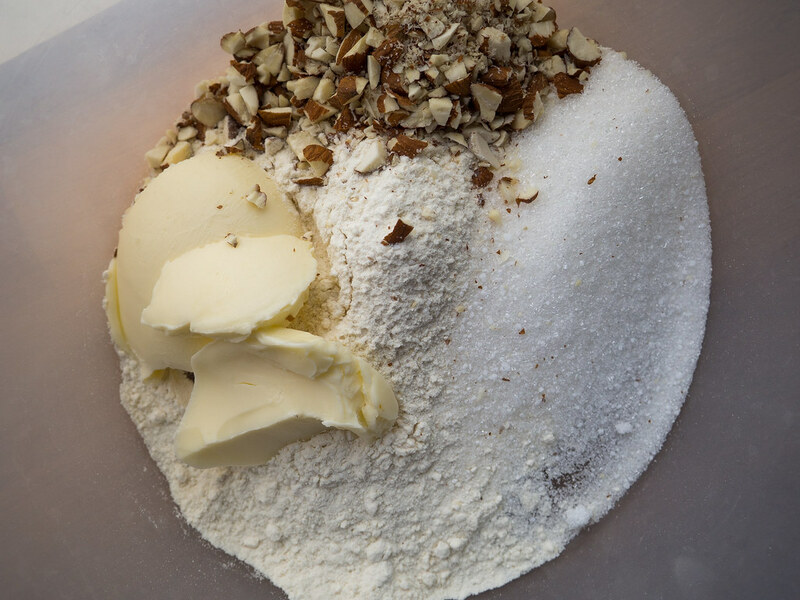 Keep an eye on the crumble while it is in the oven – it tends to burn easily. 9. When done, let the crumble cool off while you continue preparing the whipped vanilla sour cream. 10. 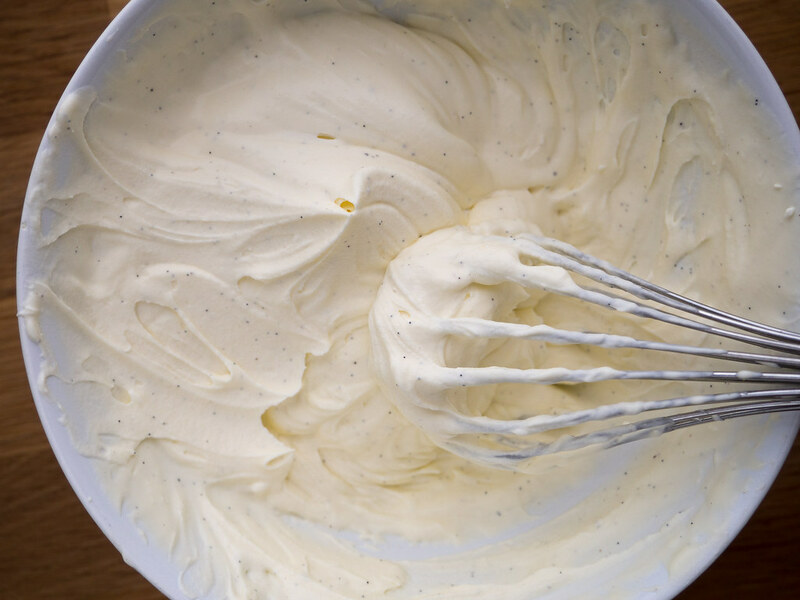 In a bowl; add the 38% sour cream, vanilla powder (or vanilla essence) and whip it for a couple of minutes. 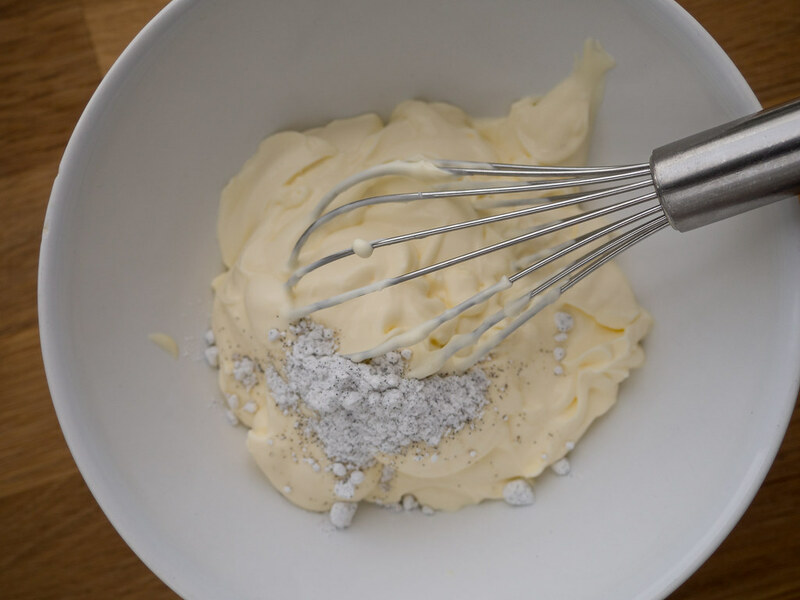 The consistency should be a little like a whipped cream. 11. On a nice dish; add some roasted rhubarb, a scoop of vanilla sour cream and finally sprinkle with some almond crumble.